… is without any doubt interface / icon design. It is hands down one of the biggest obstacles (actual content creation is the biggest ;) ) I’ve faced since I started to work on the game and it’s still a big one to overcome. Lets take the basic control interface as an example (..of my design insecurity and painful suffering in this case ;) ). the original plan (back, when I experimented with Visionaire) was to have a “Day of the Tentacle” style interface. Six verbs, static and always visible in the lower half of the screen, nothing too fancy. So, in 2012 I started to work on the first tests…. the text was painted digitally, then mapped on to 3D grids in Softimage and rendered with Arnold (please note the complete unnecessary shadows and depth of field :) ) the main reason to move the 2D text into the 3D realm was primarily the way better animation capabilities, but in hindsight, it just was a big time-sink and should have stayed in a simple on/off concept-quality. It opens directly beneath the cursor, and seems to have become the standard interface of modern point and click adventure games. I grabbed some free icons from the web to test the game logic, while i drew version after version of 2D icons, but not a single one was really convincing or fitted the style of the game. 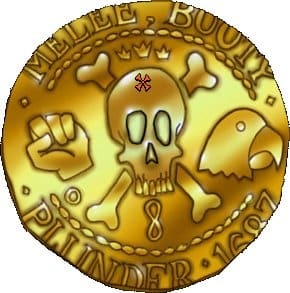 so to get over this hurdle, I started to experiment with a 3D prerendered coin interface. The initial tests were pretty promising, so I dropped the 2D plan, and continued to build the icons out of parts of the protagonist. I’m still not 100% convinced of the idea, but the consistent look seems to fit quite well with the game..
so, what’s the reasoning behind the strange doughnut shape of the thing? Mold feels and controls quite differently compared to standard point&click adventures (you run fast and a lot ;) ), so it got really annoying when you double clicked on the set (to run), but hit a hotspot instead. The double click opened the menu and executed the choice in the center. With the hole, it simply opens and closes again, which helped to keep the gameplay fluid and intuitive. I’d still like to write a dedicated post on the frog, but lets see when that happens. The primary goal, ‘le grand objectif’, is to finish the first three sets this year. (sounds crazy slow if you think we’ll have to do ~35 sets in total…. totally crazy…) – Fortunately (or unfortunately) I’m still hoping for a miraculous increase in efficiency ;) so the journey continues. But this manual effort/process with a decent and consistent quality was and is very time consuming, and nothing will ever change that. and that’s all I got for today. Hopefully these screenshots give you some insight or ideas of how this kind of projection mapping works. 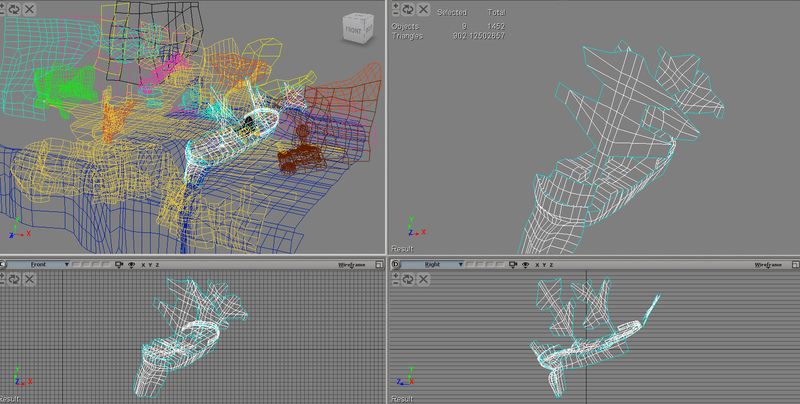 Before we were able to continue our tedious workflow, we had to first build the lowres geometry. It’s constructed with simple grids, in a similar style as the layers we outputted before. 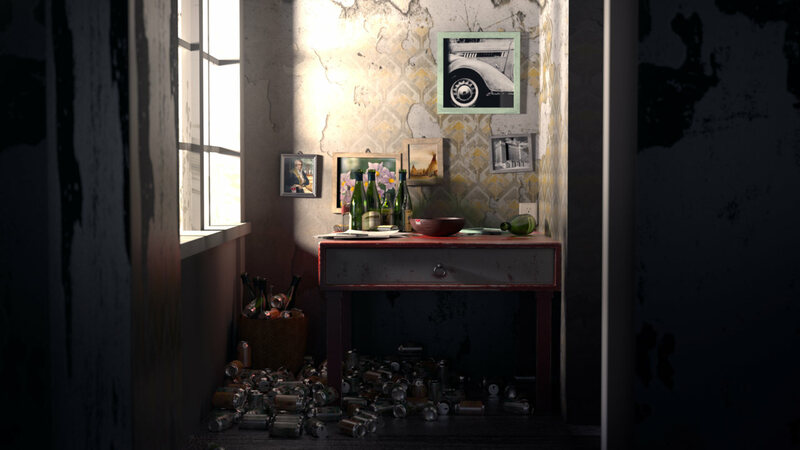 These objects are formed and located as close as possible to the highres geometry. 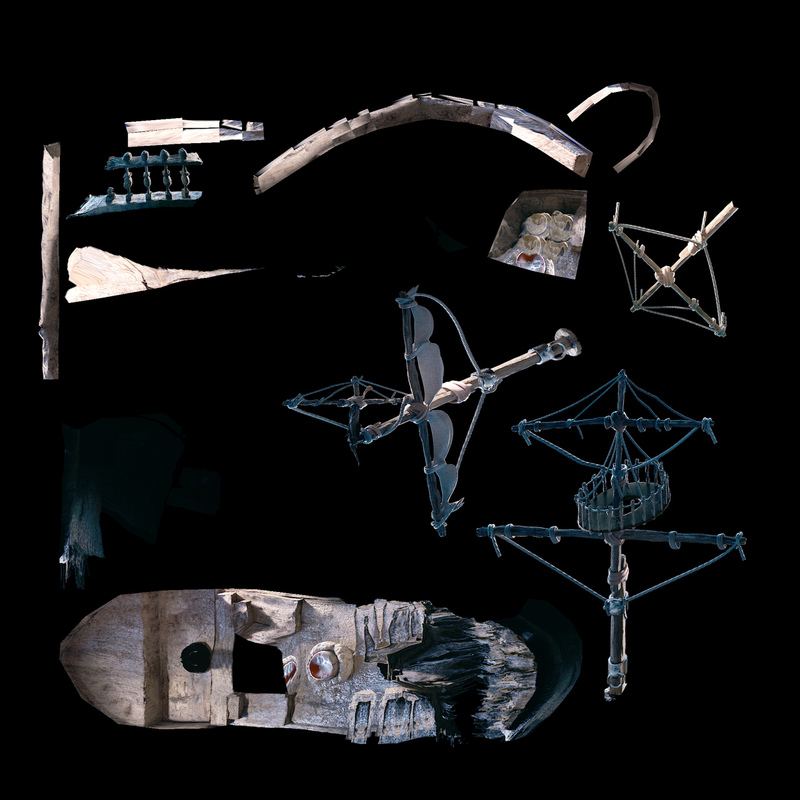 every object got its own UV space, which were combined and packed into groups (shown via different wireframe colors in the image above) depending on their relative screensize (objects far away get less UV space). one tool to bake them all…. In our first attempt we baked everything in 4K, but we later learned that some GPUs/platforms don’t support it yet, so we regrouped everything and exported 2K maps just to be safe. and this is result, the textured FBX model. 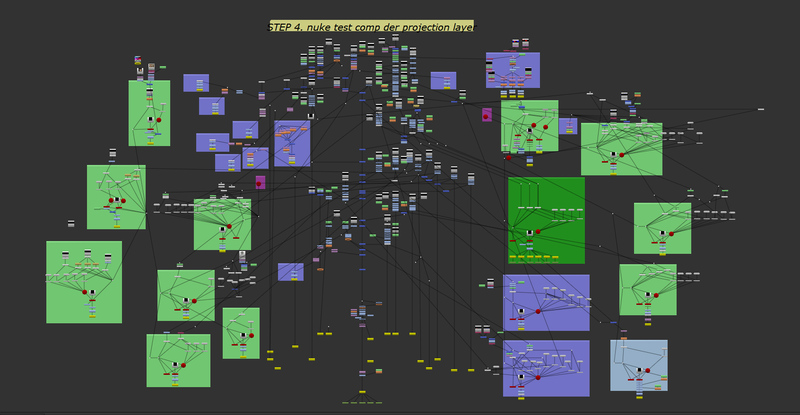 Well, that’s basically the workflow before we move on to the characters, and later the realtime business of things. Eventually it took about 50 shaders, 20 area lights and one HDRI (mostly for reflections) – and months of spare time work ;) to get the look and atmosphere we wanted. Image composition, color corrections and other fixes, were done simultaneously at Babettes company after working hours. Thanks for the opportunity, Optix Hamburg! The 3D lookdev phase was heavily coupled with 2D compositing, meaning we had to handle massive 10K resolution comp trees as well. And yes, they got big, real big… which brings me to the last point of this part. Seriously… but still, I can’t think of any better way to do it, but this doesn’t make this workflow any good ;) Small “mistakes” added to the problem, naturally. One example: during the lookdev phase, I decided to add a separate rim light pass for compositing (like i do most of the time..) …which doesn’t sound like a bad idea at all, but after we split the set into over 20 passes/layer we now had to manage over 40……. a bad idea after all. Every pass got rendered in 10000×3000 resolution, some with multiple states. The frog had around 400 frames alone (and took 2 weeks to finish on 3 PCs). The big passes took about 5 days to complete (on an up-to-date i7) for one frame i might add, so you can imagine how painful previews were (even at lower samplings and resolutions). But the true fun is just about to begin ;) Every pass was rendered with AOVs (separated diffuse, reflection, indirect diffuse, etc. 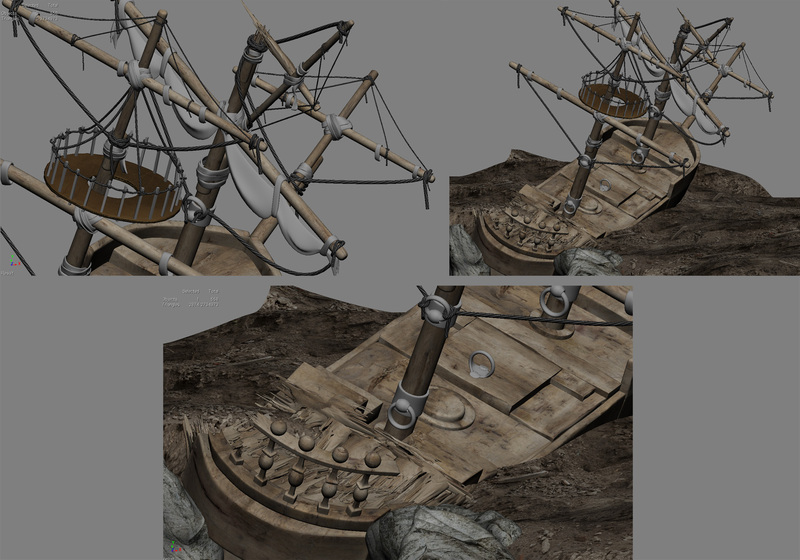 layers) and needed to be pre-combined before it could be used and passed through the lookdev comp. (it would have been way to slow and memory demanding to have all AOVs in the final comp, so we seperated both tasks). Before we could output the final textures used on the projection mapping geometry, the images had to be test-combined, tweaked (again…) and eventually baked to a square UV space, but this part will be covered in the next post. I’ve already written a little bit about parts of the production in earlier posts, but lets start from the beginning to give you a complete picture of how we did it. If you want to read all posts dedicated to the production sprint (resulting in the prototype), please click here. Next, we built a very rough dummy set in 3D to define some of the proportions, which 1. enabled us to test the set in unity very early, 2. makes it easier or even possible for multiple artists to work and contribute to the same set. We split everything into several sub groups, modeling tasks if you will, and started to distribute them between Babette (Kahn), Florian (Stucki), Thorsten (Kesse) and myself. 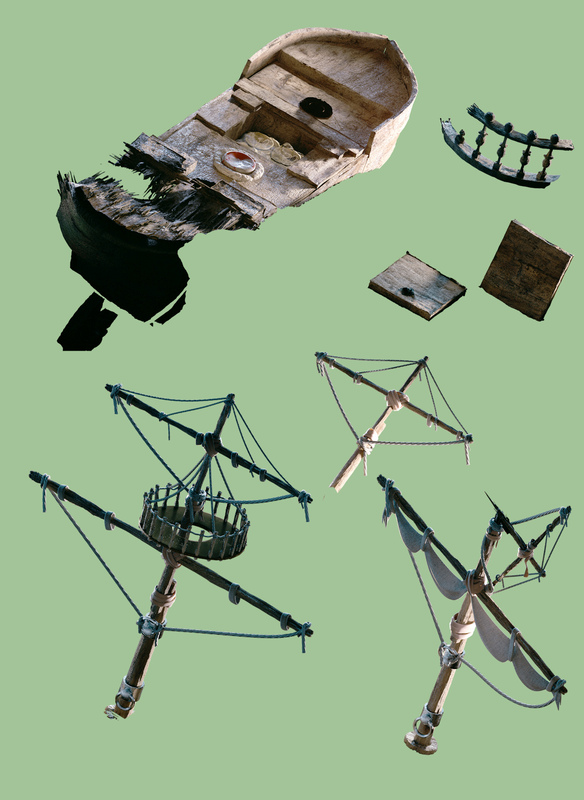 Lets take our little toy ship as example. we’ll cover the rest of the creation process next time, so stay tuned! It has been an awful long time since i posted an update, which could be either a sign of no or a lot of progress ;) in our case it’s fortunately the latter… we (almost) finalized the first set, animated a few characters/animation cycles, hooked up dialogs and interactions, and even home brew a finite statemachine based AI to add more dynamic life to the set. It’s slowly but steadily shaping up to a real game ;) who’d ever believed that? I hope you like it, and merry christmas! I’ll continue to post on this blog of course, Facebook is going to be used for bigger announcements and all client-close-combat situations ;) Tell us what you think, and help us to improve the game!